Going on an adventure? Be smart. Travel safe and have fun! TravelDoc™ clinics are easy access travel vaccination clinics and are a subsidiary medical service offered by Regent Street Clinic™. With multiple locations around the UK, we offer travel vaccinations in Nottingham, Derby, Leicester, Sheffield, Leeds, Watford and Birmingham. The clinic is led by a team of specialist travel health doctors, who have undergone postgraduate training in the field of travel medicine (at the Royal College of Physicians and Surgeons of Glasgow), to address the health needs of the increasing numbers of people travelling abroad and to generally promote a positive, healthy and safe travel experience. We can help with last-minute travellers and the more “complex” travel health requirements of gap year students or those with other health issues, for example, the pregnant, elderly or diabetic traveller. We pride ourselves on our patient-centered service, focusing on offering bespoke travel risk assessments aimed at reducing the risk of ill-health whilst abroad. Please feel free to give us feedback, we welcome patient input which improves the quality of the service we offer. We want people to be well-equipped for their adventures abroad. Be smart, Travel safe, Have fun! We offer a full range of services including all travel vaccinations and antimalarials, including yellow fever vaccine, hepatitis A and B, rabies, Japanese encephalitis, meningitis ACWY, cholera, typhoid, tick-borne encephalitis, tetanus, polio and diphtheria. We also offer free sterile medical kits, advice on reducing the risk of diseases for which there are no vaccinations (such as dengue fever and Zika virus) and treatment of conditions such as travellers’ diarrhoea and altitude sickness. Our clinics are especially popular with last-minute travellers. When you attend our clinic, we will review your previous vaccination history, medical history, the present state of health, medications and any allergies. Please keep your immunisation documents safe, ideally with your passport, for use during your travels and as a record for the future. We only recommend those vaccines that are considered most important. The vaccinations you need will depend on a number of factors and are determined by your specific risk assessment – these factors include the country you’re visiting, the activities you will be undertaking, the length of your stay, your accommodation, your previous vaccination history and recent outbreaks in the regions of travel. Our experienced travel doctors will be able to give you specific, up-to-date information on the vaccinations and anti-malarial required for your destination and other measures needed to protect your health whilst abroad. Free advice for people who have attended the clinic even once you are abroad, with access to medical help from a TravelDoc™ travel doctor/nurse. Patients usually self-refer or may have been referred to our clinic by their NHS GP surgeries. We do not have access to your NHS records and are relying on some knowledge of previous vaccination history where possible. If you do not have this history, it can be requested prior to your appointment with us by requesting this from your NHS surgery. If you are unable to obtain this information, we will still be able to work out how best to help you by undertaking a formal risk assessment to protect you during your trip abroad. 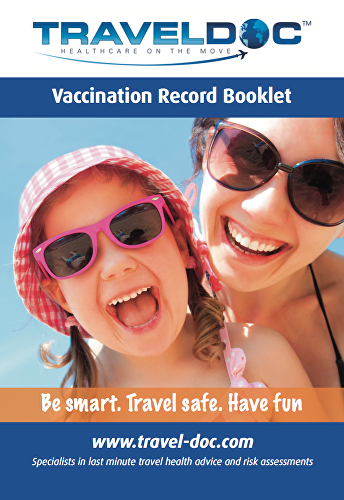 You will receive a vaccination record booklet after your visit to keep with your travel documents and to share information with your NHS GP. We appreciate that travel vaccination can be costly, however, we pride ourselves on being very competitive when it comes to getting ‘paid for’ vaccinations. We will only recommend the vaccinations that are appropriate for your specific journey and will be aiming to protect your health in the most suitable manner (vaccinations, insect repellant sprays, malaria prophylaxis, good advice etc). Our role is to give you the latest relevant information about country-specific risks, recent outbreaks and emerging health-related issues. We are here to facilitate and help. So relax. Be smart. Travel save. Have fun!